New Zealand. It’s more than the land of hobbits and Lord Of The Rings. It’s been a place on my “Go to:” list for over 10 years now and a glance from the airplane while transiting to Australia was tantalizingly delicious. Green fields. Stone fences. A lack of crowding. Emerald waters. Snow capped peaks. It seems too good to be true. Let’s take a look through the lens of fellow DPS readers . We are all participants in an increasingly visual culture, yet we rarely give thought to the ways that photographs shape our experience and understanding of the world and historical past. 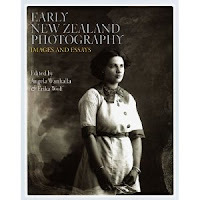 This book looks at a range of New Zealand photographs up to 1918 and analyses them as photo-objects, considering how they were made, who made them, what they show and how our understanding of them can vary or change over time. This emphasis on the materiality of the photograph is a new direction in scholarship on colonial photographs. The writers include photographers, museum curators, academics and other researchers. Their essays are not intended as definitive readings but rather offer a variety of ways in which to read the images they have chosen. In the course of the book, they explore a host of issues related to the development of photography in New Zealand. World War I is the end point, as it coincided with profound cultural shifts with the expansion of the mass illustrated press and the rise of consumer photography, as well as a change in New Zealand's place in the world. Contributors include: Wayne Barrar, Roger Blackley, Gary Blackman, Chris Brickell, Barbara Brookes, Sandy Callister, Simon Dench, Jocelyne Dudding, Keith Giles, Jill Haley, Ken Hall, Ruth Harvey, Kerry Hines, Antje Lubcke, Brian Moloughney, Max Quanchi, Rebecca Rice, Cathy Tuato'o Ross, Simon Ryan, Angela Wanhalla, Christine Whybrew and Erika Wolf.